From Buzzfeed, a back-to-school headline you may not have considered: Is Your School In A Flood Zone? For example, a Salt Lake City rainstorm just caused a flash flood that damaged many properties, including East High School where Disney’s High School Musical was filmed. According to a report from the Pew Charitable Trusts and consulting firm ICF, some 6,444 public schools across the United States that serve nearly 4 million students are located in the 100 counties with the highest composite flood scores. 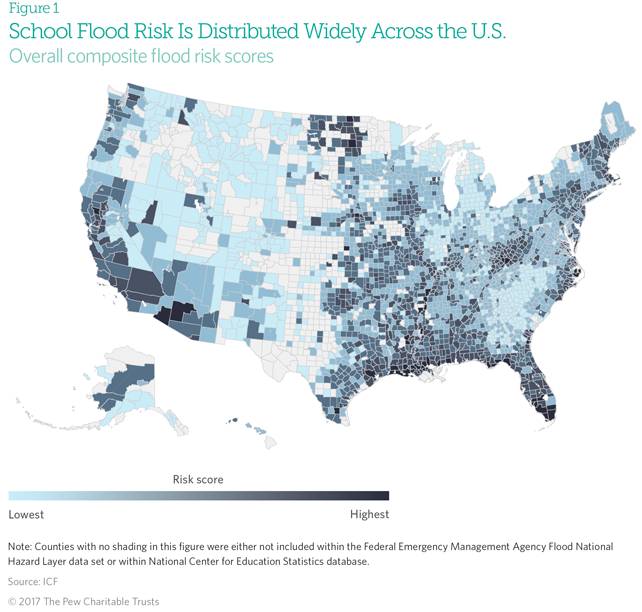 The risk of school flooding is distributed widely across the U.S. Schools in both inland and coastal areas have the highest composite flood risk scores, the report says. Think Atlantic Coast, Gulf Coast, Mississippi River corridor, and southwestern Arizona. Even when a school is not located in a flood zone, students who attend it often live within areas of flood risk. The composite flood risk score calculated by ICF is based on three indicators: a school’s location within a designated flood zone, the percentage of a school’s neighborhood (as represented by ZIP code) located within a flood zone, and the number of historical flood-related federal disaster declarations in that county. Taking proactive steps to reduce risks and improve flood safety is a growing priority for some schools. Insurance Information Institute facts and statistics on flood insurance here.